What is this? An episode from The Twilight Zone? Maybe you recall that one….the mega-alien from another planet lands on earth and tells the United Nations that he is only there to help earthlings and resolve their many problems. He presents them with a book detailing how they will accomplish it. “The Scientist” and “The Scientist’s Assistant” begin to try to crack the code and succeed in translating the title: “To Serve Man”. After the mega-alien has demonstrated his powers and does a number of good deeds for mankind, he begins to gain the trust of the earthlings. As more and more people begin to trust the mega-alien, planet to planet travel begins and earthlings now start to board the mega-alien’s spaceship for a trip, “From earth to Our Planet” (a different kind of weekend getaway). Alas, as “The Scientist” decides to also make the trip, “The Scientist’s Assistant” is frantically trying to make it through the crowds gathered for the next liftoff. Just as “The Scientist” is climbing the stairs to the ship, she reaches him, screaming frantically……’The book, “To Serve Man”…it’s, it’s a COOKBOOK!’ One of my favourite episodes of The Twilight Zone. 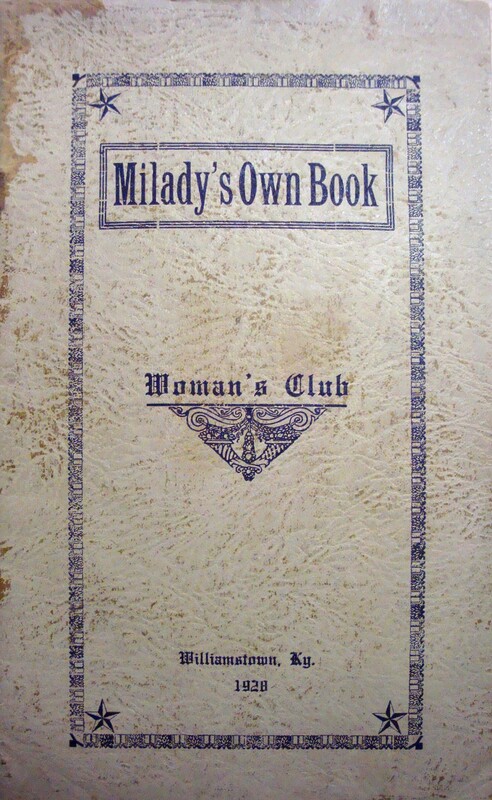 So what’s with “How to Cook Husbands?” Since you’ve asked, it’s part of the preface to “Milady’s Own Book” published by Woman’s Club, Williamstown, Kentucky, in 1928. In “How to Cook Husbands”, the preface, written by Elizabeth Strong Worthington, says that “A good many husbands are entirely spoiled by mismanagement, in cooking, and so are not tender and good. Some women go about it as if their husbands were bladders and blow them up. Others keep them constantly in hot water”. Ms. Worthington advises, “In selecting your husband, you should not be guided by the silvery appearance, as in buying mackerel; nor by the golden tint, as if you wanted salmon”. 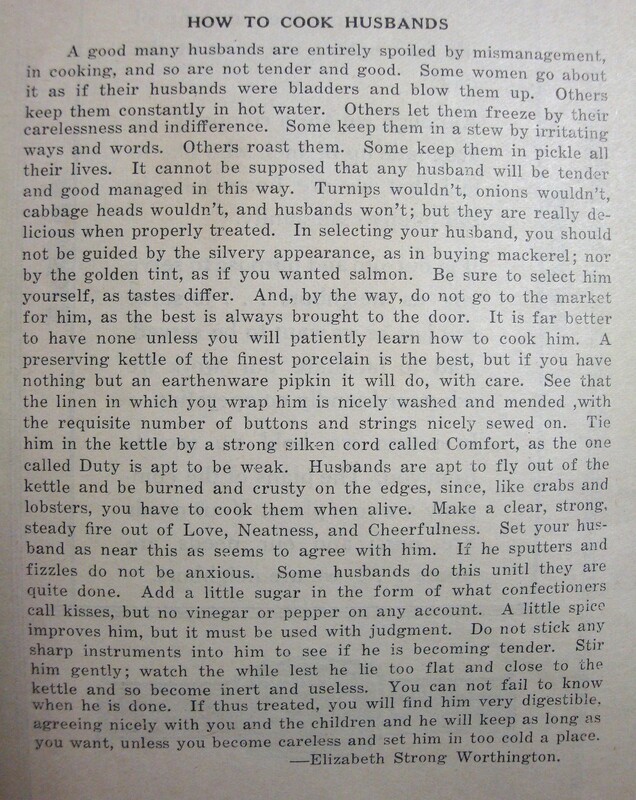 She further advises women that “Husbands are apt to fly out of the kettle and be burned and crusty on the edges, since, like crabs and lobsters, you have to cook them when alive”. Continuing with her epithet, she tells women that “A little spice improves him…” and “You can not fail to know when he is done. If thus treated, you will find him very digestible, agreeing nicely with you and the children and he will keep as long as you want, unless you become careless and set him in too cold a place.” So, that’s how you cook a husband! Now, in case you thought to yourself, “That’s it?”, there are some real recipes in the booklet, including “Salmon Wiggle”, “Black Cake”, “Transparent Pie”, “ Sausage Receipt”, and “Corn Dodgers”. So, there you have it. You now know how to cook a husband. Get cracking, but don’t keep him in a stew with irritating words and ways and certainly do not keep him in a pickle his entire life! This entry was posted in Cookbooks, Cooking, Cooking and Social History, Eating, Recipes, Uncategorized, Vintage Cookbooks and tagged Cookbook, cookbooks, Cooking, Elizabeth Strong Worthington, food history, KY, Milady's Own Book, social history, time capsules, Williamstown. Bookmark the permalink.